There were some costs we simply couldn’t cut – our rent, for example ($1675), or Mike’s train pass to get to and from work. But in pretty much all other areas, changes were made. From the day that budget was drawn up, we didn’t leave home without a packed lunch a single time. Not a day. We both also started walking to work – my walk-commute was a good 7k/4.5mi stretch one-way and definitely took some time, but I invested those hours in talking to family and friends or listening to inspiring podcasts (often theme life change, let me tell you). I also started run-commuting once I realized there was a shower for me to use at work. Mike had previously taken a bus from the train station up in Norwalk where he used to work, but started walking this section instead (the bus ride was an additional cost and wasn’t covered by the train pass). We started selling off things – textbooks, sunglasses, shoes, dresses and suits to begin with and furniture and kitchen equipment as the actual move was getting closer – and saved every penny made. We stopped eating out more or less entirely, we made sure to cook big batches of cheap meals (lentil soups and stews were go to’s), we started making our own yogurt (yep – and this saved us so much money! One liter of organic, locally produced milk was $1.99 and one liter of organic, locally produced yogurt was $5.99), making our own granola, soaking and cooking beans instead of buying already canned. We went to different stores for different things if it meant a lower price, stopped getting coffees, teas, juices and smoothies out… you get the point. We really lived according to the Swedish principle of många bäckar små gör en stor å* – and it worked. It. Worked. So. Well. *Många bäckar små gör en stor å translates into “many small streams make up a river” – and I trust you get the point. Walk-commuting with this view going home wasn’t too bad, after all. I took the Manhattan bridge across from the East Village to Brooklyn (where I worked), and while this less crowded route attracts its fair share of – ehm – interesting characters, I want to argue this is where the tourists should be – where you can actually see the Brooklyn bridge! Now, I’d like to inform you all that we were not big spenders prior to this change. Not even remotely. I’d been a student until June 2016 and had for years and years lived on a very tight budget. Unless using a gift card from someone, I haven’t bought a single piece of clothing for myself (running gear excluded) since 2014. And even though Mike had had a good, steady income for quite a while, he’s naturally also fairly frugal and cautious when spending money. With that in mind, there weren’t any massive savings to be made anywhere. We lived in a small (27 m2/250 sq ft) rent-controlled (but still really expensive from a Swedish point of view) apartment that was clean and tidy and not at all overflowing with stuff. Needless to say, we had to take a close look at everything to find ways to cut costs and save cash. It’ll sound insensitive of me saying this, but our primary incentive during this first phase of “transition” was purely financial. We knew we wanted a life away from stress, consumerism, concrete. We knew we wanted quiet, nature, a slower and more sustainable life. But in order to get there, we needed to focus on money. Because however much you try to escape it, living in this modern world of ours requires some actual monetary funds. That’s not rocket science. It would have been irresponsible of us to not acknowledge that, and that’s the last label I would put on us. The outcome of the budget restrictions, however, set us off on the right path immediately. Because as we were thinking we were ‘just’ saving money in every way possible, we were already downshifting. Already going for a minimalistic approach to life. Already embracing an anti-consumerism philosophy. Already choosing a more sustainable lifestyle. And while it might sound funny to you now, that didn’t really cross our minds. All of that was supposed to happen once we had packed up our bags and actually left Manhattan for the woods. I love thinking back at this time. I love remembering the satisfying feeling of transferring another chunk of money to our Swedish bank account, seeing our dreams slowly coming true and all the hard work showing results. One of my favorite things to always keep in the back of my head is that hard work always pays off… in the end. My brother (who’s in university right now) told me the other day about someone cheating during an exam, and described the all-too-familiar feeling of frustration he felt (that I’m sure we all feel) when witnessing something like that. We cursed a little, of course, but then agreed it’ll catch up with them at some point. Putting in legit hard work will ALWAYS pay off eventually. I find that thought comforting. It makes the hard work easier on me, because I trust I’ll be reaping the benefits one day. One of the more emotional days of my life, saying goodbye to this place. It’ll forever be where I truly found peace within, and became the version of myself I actually want to be (and made friends with the concept of cooking on a gas stove). So there we were, with an apartment packed up into some boxes that would be shipped and a few bags we’d take on the plane. It was a surreal feeling, standing there in the empty space that had been our home for years and years and now was to become the home of someone else. We both loved that studio endlessly. It was a quiet, neat-kept refuge – a peaceful oasis seemingly a whole world away from the craziness of the New York City streets – and we’d had some of our lives’ best moments in there. Our first kiss, for example, and many evenings daydreaming about adventures ahead. Wedding planning, ski trip planning… and planning for this upcoming year of freedom, naturally. When we closed the door behind us, it was emotional. Leaving something so familiar behind and stepping into the unknown – where no paychecks were waiting – was as scary as it was exhilarating. Needless to say, though, we did it. Otherwise, I certainly wouldn’t be sitting here now, writing this. Living our “normal” day-to-day life here in Sweden obviously costs us some money. But not all that much, in the end. We have a relatively small mortgage on our house, thanks to help from family, and have a nice and low interest rate. We have a monthly food budget of SEK 3 000 (USD 330), which then includes all meals, every day for two long distance runners (a.k.a. we eat a lot). The food we buy is Swedish grown and produced as well as organic to the largest extent possible, mostly plant based and… naturally pretty cheap, actually (we also make sure to utilize coupons, deals, discounts etc.). We eat a lot of potatoes, root veggies and legumes, for example. We can whip up a giant batch of stew for practically nothing and have us be set for dinner for several nights. We don’t skimp on taste, quality, nutritional content or – we’re athletes after all – quantity, but we’re not food snobs. At all. Cabbage, potatoes and beans – sounds great. Oatmeal for breakfast almost every morning – couldn’t imagine a better start to the day. Another thing that helps in keeping our food costs down is that we live remotely – we only really go to the store once every two weeks (with some exceptions), so temptations are very limited. We’re not surrounded by endless places where you can spend money (let’s pretend online shopping doesn’t exist for a moment), and we ALWAYS go to the store with a grocery list. Carefully written out, meals planned – the whole kit. We use the app Wunderlist, by the way, which syncs lists between users – if Mike grabs oats from the shelf and checks it off the list, it’ll disappear from mine too. Just a little tip for smooth shopping 🙂 But back to food money – yes, not going to the store every day helps keeping costs down. I read recently that doing big hauls increases food waste for some people, and that only buying what you need for the day can reduce it, which is something I wanted to address – I think people are different, fundamentally, and what works for some won’t work for someone else. We never waste food. As in, it would never ever in a million years happen that we throw away something that’s simply gone bad or doesn’t suit our taste. So big hauls suit us perfectly, but it doesn’t necessarily have to be everyone’s jam. The last note on food and food costs is obviously that we also grow a lot of our own vegetables. If you’re interested in reading more about that whole adventure, you can check out THIS (link) garden recap we posted a while ago, but a quick summary here is that we managed to fill two half-size freezers with vegetables over the summer and early fall, which we’re slowly starting to dip into. The SEK 3 000 was a little harder to keep in the spring, before our own vegetables started coming in (2018 was, as I’m sure you’ve understood, our first year of growing) but a lot easier since, with some months even being lower than SEK 3 000. We’ll see for how long into late winter and early spring the freezer vegetables will last us. The satisfaction a filled up a freezer can provide… beats it all. Except maybe a break from work, sitting on the deck in the spring sun. No, that beats it all. What other costs do we have? Well, electricity. That’s usually not all that much – we use God El as our electricity supplier and we have a yearly energy consumption of 6000-7000 kWh. The monthly bill is roughly SEK 200-800 (USD 20-80), depending on current prices and time of the year, and then the electricity distribution company (Vattenfall, in our case) bills us quarterly, which means approx. SEK 2 000-2 500 (USD 200-275) per bill. Those bills always feel hefty, but there’s really nothing you can do there. In addition to paying for utilities, we have a cell phone contract each (total SEK 300/USD 33 for both), internet (SEK 300/USD 33), various insurances, garbage pickup and septic tank pumping to pay for. I won’t bore you with the details, but instead say that all in all, we need about SEK 10 000 (USD 1100) to make ends meet each month. That doesn’t leave all that much room for any unexpected costs, though, so we like to think that SEK 12 000 is our monthly minimum. We still have a separate budget for ski trips (which are really the only trips we want to spend money on – take note that these are only trips within Sweden), but all the other budgets (home renovations, garden set up etc.) have sort of morphed into one – we don’t have any bigger projects that will require a larger chunk of money ahead of us, hence we can more or less just focus on our monthly. Now, it might seem as if we’re making endless sacrifices and live an empty life. That couldn’t be less true. In all seriousness (even though it’ll sound painfully pretentious), we feel like we have more now than ever before. We have time to do all the things we feel so passionately about, we live in a place that makes us so happy, we’re surrounding ourselves only with stuff that fills a purpose and makes us happy. The one big elephant in the room with regards to our carbon footprint are the inevitable flights across the Atlantic to see our American half of the family. With Mike’s parents and brother as well as some of our very best friends over there, we feel inclined to say… we can’t opt out of flying completely. Argh, it pains me, hearing myself say those words. I think most of you understand the dilemma we’re facing. I’ll leave it at that for now. When you’ve reduced your costs of living to the very accomplishable SEK 12 000, your horizons automatically get widened. You can dream a little, and then a little more. If that’s what you need to bring in for your machinery to run smoothly, you quickly realize you have the option of including a lot more free time in your life. Modern culture has taught us that we need to work a lot, make a lot and spend a lot. What if you start in the end there, and reduce your spending? Then you’ll need to make less, and thereby work less. It might come across as provoking to some – the way I portray this as something so utterly simple to do – but I firmly believe most of us possess the ability to shift down. I really do. If Mike and I could, then you can. I promise. Then: a city boy stumbling upon an ocean of ramps when hiking in upstate New York. Now: a seasoned forager, with his own secret chanterelle spots. Conclusion: he had it in him all along. In the end, it all comes down to choosing to change your priorities. Choosing to change, with the emphasis on choosing. All around us, we see and hear people being overly stressed and wishing for more time to… live. To be. To do what makes them happy. But the same people often also regard a lot of things non-negotiable – the big, fancy house, the brand new car, the expensive vacations, the exclusive food, the convenience of eating out and getting take out, the frequent shopping sprees. It’s been drilled into our heads what success looks like, what happiness looks like, what a respectful life looks like. Unfortunately, all of the things listed above – the house, the car – are often closely associated with the idea of those archetypical images of success and happiness. In the eye of those ideals, we’re total losers, Mike and I. Our house is way too small, our clothes way too old, our bank account way too slim. Our titles nowhere to be seen, our expensive vacations absent, our fancy restaurant visits all too spread out. Yet, as previously stated, we don’t feel poor. Or cheap. Or like losers, for that matter. We feel relieved. Relieved to not be in the race anymore. And… content. More content than ever before. One more thing, before I’ll let you go. I think it’s so sad that being financially smart, spending your money carefully, watching your expenses and trying to minimize them as much as possible often has you come across as… poor. And/or cheap. I wish we would see a change in society here – where mindless spending and endless splurging aren’t synonyms for happiness or success. That opting out of shopping, planning your meals and minimizing your waste wouldn’t portray you as someone struggling to make a living. I wish those would be respectable personal choices, such as choosing tea over coffee or preferring skiing over snowboarding. I’m not saying everyone would automatically find their happy if they chose to shift down. To slow down. But I think many of us would, actually. And our planet would certainly feel a lot better, whether it’s your initial incentive or one huge bonus along the way. I’ve said it before but I’ll say it again – whatever feels close, is harder to harm. Living closer to nature will make caring for it more natural. And that, we need more of. PS. The attentive reader might now think “hey, didn’t they say they would take one year off? Hasn’t it been longer than that?”. Ah, good point. It sure has. Turns out we’re in this simpler lifestyle for the long run, and will figure out ways to make ends meet as we go. Such a relief we both like oat meal so much! Above all – enjoy the ride. Go pretty places. Fall in love. Swim in the ocean (and then, wave to the camera). It’s in the small stuff life really shines. Bra inlägg, heja er. 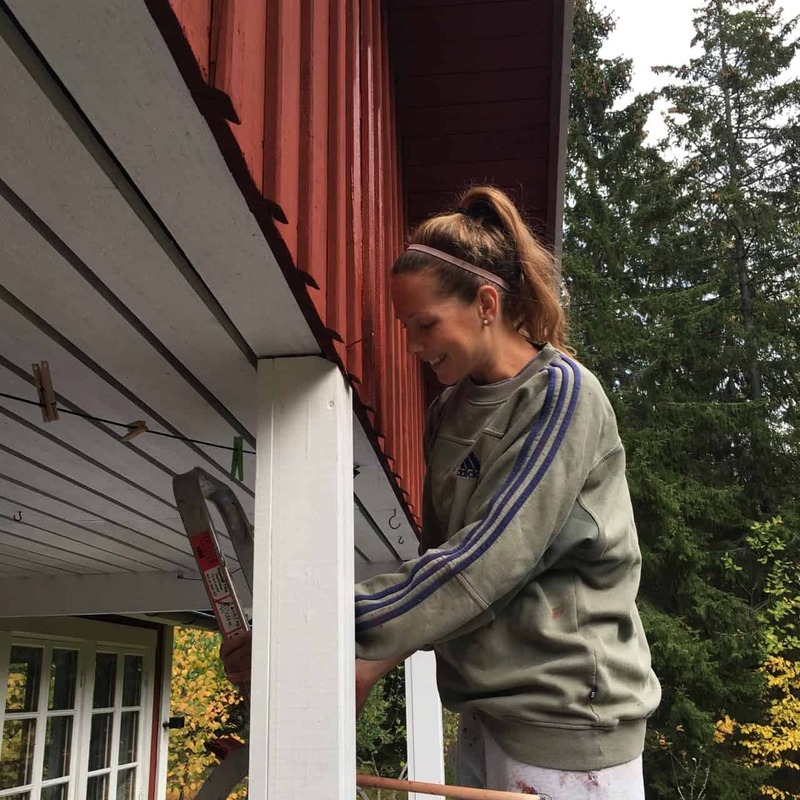 Jag tycker det är kul att utmana sig och leva billigare och enklare, således göra mer saker själv och fundera ut nya lösningar på hur problem kan lösas med minimal/ingen kostnad. Som en del i den svenska FI communityn vill jag rekommendera två klipp. Ovan skulle en heltidsarbetande person som lever lön till lön inte våga satsa på om denna alltid dröm om det. Det krävs enormt sparande och minimalistiskt levande för det för att bryta sig loss från ekorrhjulet (normen), för att våga satsa, och där inkomsten inte spelar någon roll då du redan är FI. Hear hear! Kunde inte instämma mer. Tack för klippen, de ska vi definitivt kolla in! Har inte varit helt medveten om att det finns en FI-community här i Sverige, men gillar det skarpt. Och det du framhåller med att FI inte är slutmålet utan början, ja men precis så är det ju! Det är bortom paycheck-to-paycheck, strikta arbetstider och (i somliga fall) icke-stimulerande arbetsuppgifter som livet verkligen börjar. Nu är inte vi ekonomiskt säkrade för all framtid, men vi har i alla fall skapat ett liv som inte kostar oss särskilt mycket pengar. Det ger oss en känsla av frihet, och jag skulle inte byta den mot något! Har du satt upp specifika mål för egen del, t.ex. ålder då du vill kunna sluta arbeta, eller en viss summa (den förväntar jag mig inte att du vill dela med dig av, utan mer ja/nej)? Tack för intressanta och tankeväckande kommentar, igen! Uppskattas! Som planen ligger just nu kommer jag kunna nå ekonomisk frihet om 7år, det bygger på att jag fortsätter arbetar heltid. Totalt behöver jag ca 3miljoner för få avkastning som täcker utgifter om 12 000/mån att leva för. Ränta-på-ränta effekt hjälper en hel del. Barn lär komma in i bilden och då behöver jag kanske lite mer, men tror jag kommer arbeta i någon form och i perioder efter FI så jag hoppas inte det tar 7år att bryta mig loss utan det kanske räcker med halva den summan. Tryggheten är ju djup rotad i oss före en vågar säga upp sig utan ha något nytt. Trevlig och intressant läsning! Jag hade dock hoppats på att få läsa läsa lite om inkomsterna också, inte vad ni tjänar haha men om ni jobbar alls, i vilken utsträckning i så fall och med vad? !